I hope you can use today to grow knowledge. Share best practices. Make plans…. Let’s Innovate! – Sam Muller, Opening Address at the 9th annual Innovating Justice Forum. 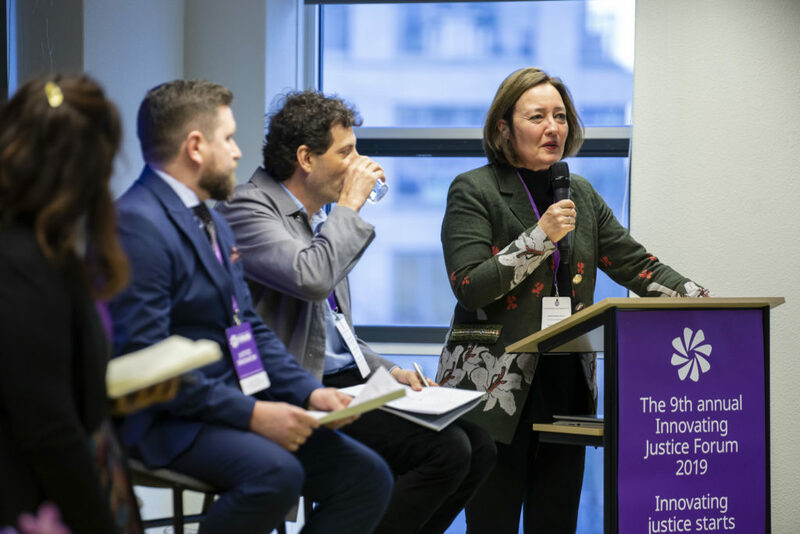 This February 2019, HiiL hosted the global-scale Innovating Justice Forum; the annual event for the best and brightest in justice innovation from all corners of the globe gather. 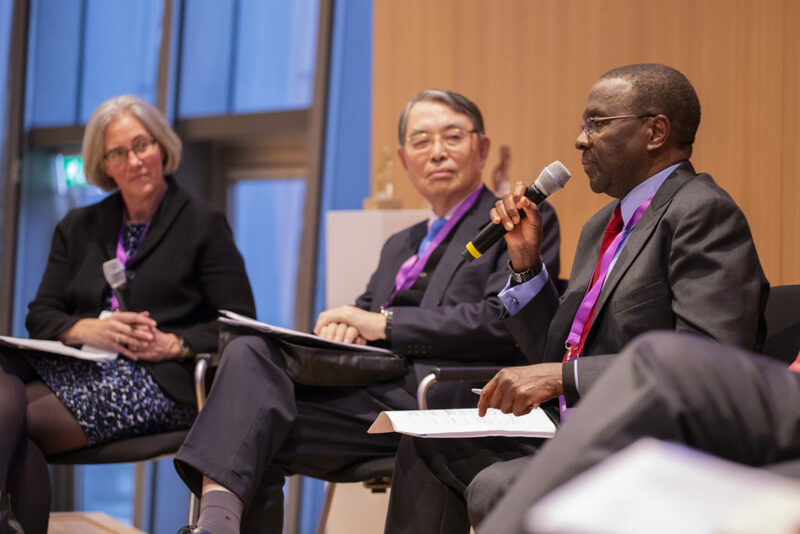 The Forum provides the most important paradigm shift for justice in decades: people–centred and evidence–based ways of working towards solutions. The theme of the Forum was ‘From innovation to scale’. A newly published report for the Task Force on Justice, which HiiL’s CEO has and continues to advise on, calculated the size of the access to justice gap to be in the billions. 4.4 billion people are excluded from the opportunity the law provides. 1.5 billion people have unmet legal needs. 244 million people experience extreme conditions of injustice. There is a ‘silent crisis’ said CEO of LegalZoom, Eddie Hartman. But the Forum really puts the spotlight on it. More importantly, it brings forth the ways of working to effectively deal with the justice gap. Justice systems are not meeting the needs of people in a serious way, basically in every country. We must challenge some of our basic assumptions about what justice systems must do and how they do that. Justice should be re-framed in terms of the justice needs of people and the fairness of their relationships. To put into action, Bram van Hasselt, Legal Design Thinking said: Let’s work together with the users. You can teach them to get solutions on their own. The radical assumption that has been changed is of having antiquated systems that users have to live with or live without. What solutions do people want, what are the tools that best empower them to achieve them? The aim is improving access to justice in a more human friendly way. In the countries that HiiL has surveyed only one third of the problems are solved completely. Data is how to achieve people-centred justice.The idea behind gathering data on justice needs of people is to break the innovation justice echo chamber and go where solutions are needed most urgently. Private and public funding is needed to deal with this crisis, but as the Open Society Foundation working session argued: You can’t ask for more finance is you keep doing the same thing, so embrace data! New evidence-based ways of working can guide investments to deliver social impact. A value proposition change is needed: justice is not just a cost… it is a value-added. It needs to be re-framed as a social good; much like health and education. What if education systems missed two thirds of children? – Sam Muller. People-centred, evidence-based innovation in action! HiiL organizes a global-scale annual competition to promote these sort of justice innovations. The competition drew over 1000 innovators. 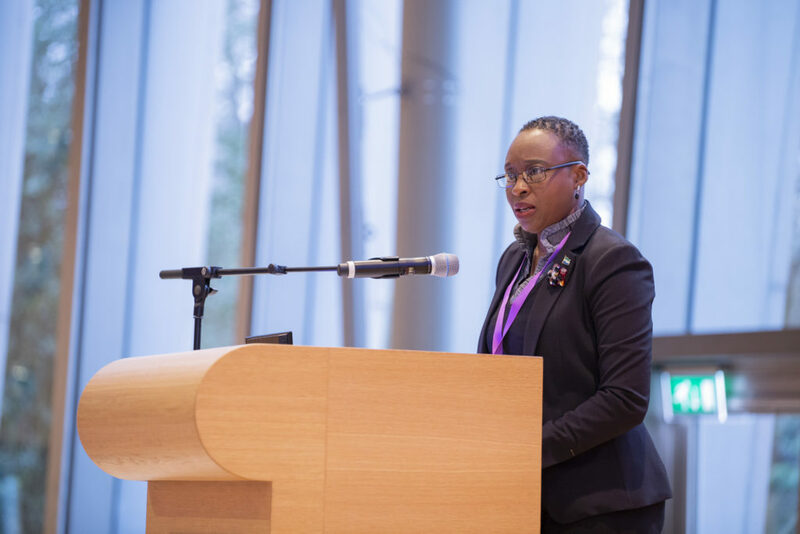 From these, a long-list of 400 was compiled, out of which a final 12 were invited to pitch their solution for an urgent access to justice issue at the Innovating Justice Forum at the Peace Palace in The Hague in front of an expert panel. The 12 innovations address a justice problem in a local context, from bike theft in Kenya, to illiterate workers understanding their contractual rights, to mobile phone applications that empower users with legal knowledge … the responsiveness of innovation to solve a problem was clear after 12 provocative pitches from innovators from Uganda, Rwanda, India, Ukraine, the Netherlands, Nigeria, Benin and more. 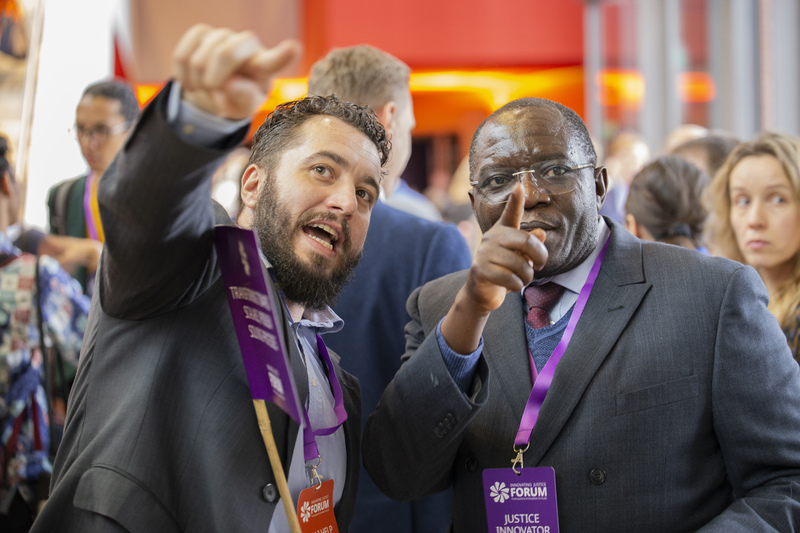 The winner of the Innovating Justice Awards 2019, is CrimeSync from Sierra Leone. The jury felt CrimeSync, pitched by Sorieba Daffae, offered a most promising innovation with a high potential to scale, “and replicability across many countries, bringing transparency to an often-compromised system”. The web and mobile application allows justice sector stakeholders to organise, collaborate and share information through electronic case management. Read more about CrimeSync here. In the afternoon of the 6th, the Justice Leadership Group shared their first-hand experience in leading remarkable change in the countries they have served. The panel included the Former Attorney General of Botswana, Athaliah Molokomme, Former Chief Justice of Kenya, Willy Mutunga, the Former President of the International Criminal Court, Sang–Hyun Song, Former Minister of Justice of Jordan, Salaheddin Al–Bashir and Judge at the Court of Cessation in Tunisia, Kalthoum Kennou. Changing justice systems to be people-centred is hard. Dangerous even. Certainly lonely. As HiiL’s Access to Justice expert, Maurits Barendrecht phrased it: you always emerge with battle scars when trying to scale justice innovations. The Justice Leadership Group’s experience in these matters assists senior justice leaders work more effectively towards people-centred justice. The sparks of partnerships forming around the Humanity Hub and Peace Palace. 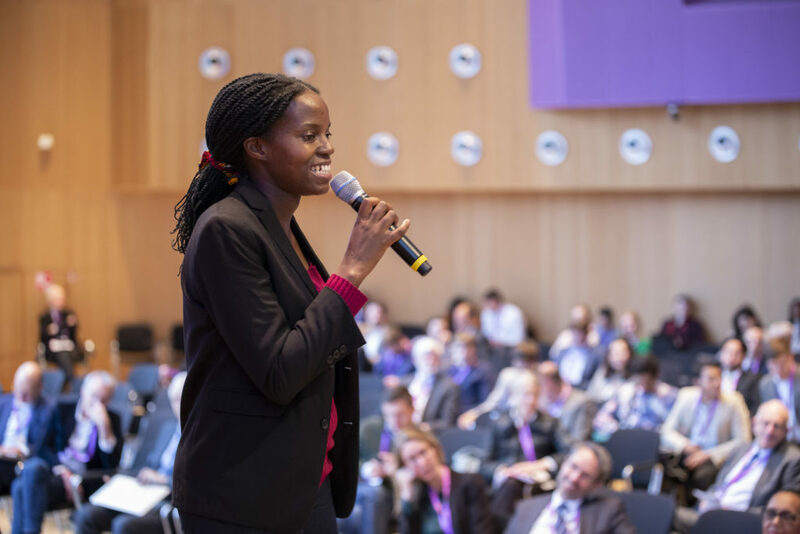 Over 350 attended the sold out event, with numerous sectors represented, including tech, Big Data, lawyers and legal academics, government (Iraq, Argentina, Ethiopia, Ukraine, Mali and more), justice leaders, finance, and social entrepreneurs. Representatives were present from the Dutch Ministry of Foreign Affairs, UNDP, Bingham Centre, Namati, UN, LegalZoom and many more. 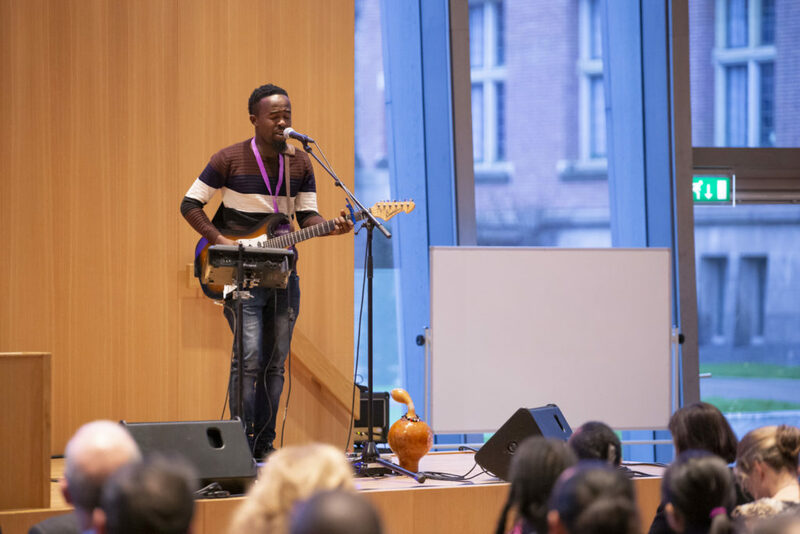 Talking to an interviewer, the Innovating Justice Award 2019 winner Sorieba Daffae said working with HiiL was the best thing that ever happened to him. Lawyer, Ana María Arbeláez Trujillo: I studied Law guided by the belief that it is a powerful tool to change the world and to challenge social inequalities. Thanks to the Innovative Justice Forum for reaffirming my thought. Founder, Kanan Dru: Powerful speeches, thought provoking panel discussions, inspiring innovators and an audience that resonates with it all… with a whole lot of learnings and connections to take back home! Wim Janson of the City of the Hague: The Innovating Justice Forum was part of the ‘biggest mobilisation in justice for a decade. Softplan: The day to day does not allow us to often absorb the impact of our work and our responsibility in the lives of tens of millions of Brazilians. In this type of event, involving organizations and reference companies around the world in the segment of justice, we realize how complex and challenging our mission is. 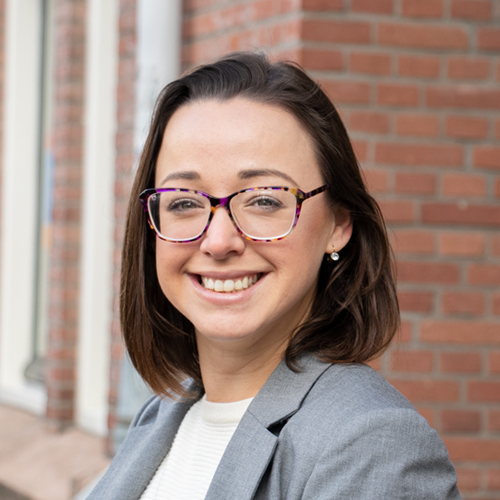 Sket, user-centric legal services: We believe in the transformation of legal services to address underserved legal needs and luckily we are not alone in our mission to make user-friendly justice a reality. We’ll be back next year with another Forum, you might even see it come to a city near you as the user-friendly justice movement becomes ever-global and more of you want to take part. Thank you to all our supportive partners for making the Innovating Justice Forum possible in The Hague: the Municipality of The Hague, the Swedish International Development Agency, the German Development Agency GIZ, the EU, and the Dutch Ministry for Foreign Affairs. Also with special thanks to Namati, Open Society Justice, the World Justice Project, Legal Design Thinking Network, Humanity X, Legal Hackers The Hague, IDLO, Softplan, Open Society Justice, Terre des Hommes, and UNDP.